Blurb: What a great atmosphere. Never once did I imagine the sun shining, even when the characters said "the sun was shining." Review: This book was an interesting beast. I'm a HUGE Poe fan. I own a gilded collection of his most famous works. I adore him. So I was really excited for this book! And it didn't disappoint. Griffin has an amazing ability to create an incredibly dark atmosphere. I never once imagined the sun shining while reading this book. Even when the characters would say "the sun shone on his hair" or something, I would picture storm clouds and darkness. That's some writing ability. And the little Poe Easter eggs made me squeal with delight. However, like Poe's original tales, the characters seem to be secondary to the plot. I couldn't relate with Araby AT ALL. She was just too wishy washy. I've never experienced guilt like she has, which may be why I couldn't relate to her. And the fact that she self-medicated her guilt with drugs and alcohol... not my favorite thing. And the two love interests just confused me. Yes, I said TWO love interests. There's a love triangle, brace yourself 'cause it's a doozy (mainly because I didn't like EITHER guy by the end, and I don't think you're supposed to). BUT, I still loved the world of the book. And in this case, that will be enough to bring me back to the next one. 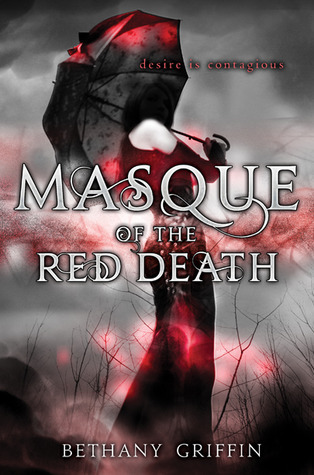 All in all Masque of the Red Death kept me twisting and turning and looking for more. Griffin says that the real action from the ORIGINAL "Masque of the Red Death" comes in the sequel to this book, and I can't wait! "Wishy washy" is the PERFECT word to describe Araby - I agree! I gave this book 3 stars as well - I liked it okay, but it was just too 'off' for me. Loved reading your thoughts as well - definitely agree! I'm half-way through reading this right now. I like it, but keep finding reasons to put it down and do something else. I'll finish, and most likely read the next one too. I love the cover and book edges being sort of frayed. It is a beautiful book to look at! I haven’t red the book yet but I think it’s quite nice to read since I am a book lover! Nice blog by the way. Last Day to Support Team Amity! Anyone interested in a create-a-cover contest? Do you review self-pub or indie-pub? Join Team Amity FOR REAL! Help a girl out, win $10! April's New Release Giveaway, March Winner!